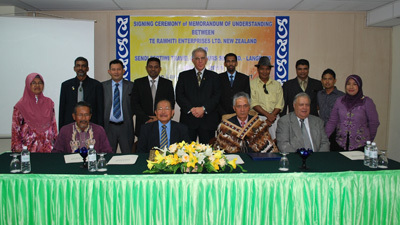 In July 2011, Matu Clendon, Walter Netto, Robert Willoughby and Manuka Henare (from University of Auckland Business School) went to Malaysia to formalise a partnership between Malaysia tourism interests via Sendi Pertiwi Travel on Langkawi as the first step to establishing a working relationship with Te Rawhiti and NZ Maori Tourism products. Indigenous Eco-tourism – Meet with Sendi Pertiwi Travel and their principals to discuss the partnership and the terms of engagement and joint programs for indigenous eco –cultural tourism, products and packages. Student Tourism – Meet with MASA College, their principals and college to consider their desire for a Student Tourism OE program with Te Rawhiti and how such a relationship might work. This discussion will involve curriculum design and the Maori Business School. OE Exchanges between Universities – Meet with the University Kabangsaan to further Student Tourism as part of their Environmental Science Degree course and OE exchange between the Universities. This discussion will include customised alignment on curriculum design that is part of the student studies and accreditation. The Langkawi Island Group has 99 islands off the west coast of Malaysia in the state of Kedah. The largest island is called Langkawi and the area was awarded Duty Free status so tourism grew. Tourism is now its major industry where before the ethnic islanders relied on fishing and farming. Familiar picture to you? It should be. Most of the islands are uninhabited and sparsely populated and their natural beauty is what attracts millions to the area. This is a strategic alliance agreement where product exchange and access to NZ Maori Tourist products and Langkawi tourist products can be developed. It also includes the idea of joint marketing campaigns and packages. For Sendi Pertiwi this event was highly valued particularly in authentic and indigenous product offerings from Maori, but also an opportunity to participate in the Malaysian tourist market of 20 millon visitors per year. This means they can send groups of tourists to us directly which is great! We would define our own tourist packages and offer those groups indigenous interaction and, eventually, business products. We can also join with other Maori tourism businesses in Tai Tokerau and elsewhere. This is very good whanau! Front row: In the blue shirt is Datuk Hashim Abdul Wahib. Matu Clendon and Robert Willoughby are to the right of him. Standing between Datuk Hashim and Matu is Professor Manuka Henare. Our four representatives then went to Masa College, which gets senior high school pupils and focuses them on university. The subjects are allied to the country’s Economic Plan so it’s a training unit for jobs. They specialise in giving students, particularly Malay-their tangata whenua-students, the workplace practice they will need when they graduate. They do this by many Memoranda of Understanding signed with, usually, industry leaders, nationally and internationally. The model is very successful so our representatives saw this school as an example for we Maori to follow in NZ, a way to capture senior Maori students to study at University level. The University is geared to promoting Malays to government positions so that they can have some control in their own country. The Four thought that this was a good model for Maori in NZ and that a student exchange programme was a very good idea. So, the second MOU was signed between Sendi Travel Agency and Masa College for a student exchange programme and also to develop Masa College’s student recruitment model for Maori in NZ. That because of our MOU with Sendi Travel, we become part of the student exchange of senior students should this relationship develop. On this day, they went to Kebangsaan University (UKM). The meeting focused on Student Tourism and Student Exchange programmes. Student Tourism is a reciprocal programmes where students can learn and experience a way of life in a different country. The idea is to have their OE experience built into their Degree programme. This will be between the University of Auckland and the National University of Malaysia (UKM) and developing cross-credits between the Universities i.e. they can do subjects here and get credited with that paper and if it develops, students from here can do the same over there. These photos came from the UKM website. 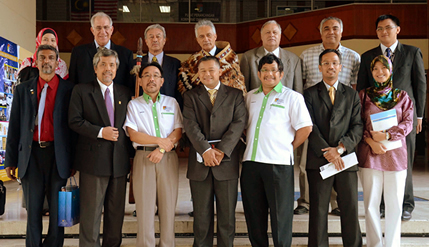 Read the associated article about this agreement there: Kebangsaan University website. In September (this month!) a delegation of Malaysian Entrepreneurs, Academics and Tourism representatives into NZ. Their visit is a culmination of dialogue and agreements that have already been signed between Te Rawhiti Maori and Sendi Pertiwi Travel, Massa College and University of Kabangsaan, Malaysia. This is a reciprocal visit to experience Maori and work with them in developing this strategic partnership to promote joint programs and campaigns for Eco and Cultural Tourism, Student Tourism and Student OE exchange programs for Maori students in NZ and Malaysia. The program includes the Auckland University Maori Business School who together with Te Rawhiti are developing the curriculum exchange between the Malaysian Colleges and Universities. One Response to "Tourism and Exchanges with Malaysia"